To adapt to the demanding market of the mobile transaction world, we utilize various forms of hardware, from generic smart devices, POS terminals to customized variant bespoke hardware to cater for transaction services at physical points of sale. Smart tablets and phones are wide spread across points of sale, as well as customers. This is a future market niche in transaction systems, especially suitable for small and medium retail services with low complexity solutions. Several such solutions have already been implemented, providing us with valuable knowledge and experience in developing and especially maintaining, softPOS applications for tablets and phones in the ever-changing smart devices portfolio. EMV compliant POS terminals are standardized infrastructure in conducting electronic payments. Our solutions can be implemented on new and existing terminal platforms used for electronic card payments. By consolidating services on one terminal device, the investment cycle for ROI is achieved much faster. Usage of EMV terminals provides opportunities for partnership with new or existing payment acquirers. Margento has developed a set of proprietary terminals, each type cleverly designed to fit its designated purpose, in order to provide friendly, seamless end-user interactions at points of sale/use, and enable secure, reliable information flow between points of sale/use and the Margento Platform. Managing a network of POS terminals can be done by Margento or by our customers through a customer Self-Care application. More advanced features, such as remote terminal configuration changes, updates and customizations, are enabled through Terminal Configuration, saving money and improving service quality regardless of terminal network size. Terminal logistics offers tracking of terminal shipments, managing terminals on field and on stock, handling support requests and warranties, managing spare parts and supplies. With it, Margento provides the complete history for each terminal, offering control over all terminal activities. Ergonomically designed and feature rich, mPOS is Margento's primary terminal, designed for counter-top and mobile use. The mPOS terminal is an affordable and multi-functional device that supports all Margento mobile transaction types and solutions. By enabling reliable and secure mobile and contactless card transactions, mPOS provides businesses with the opportunity to offer new services, generate new revenues and increase customer convenience. The Margento mPOS terminal is designed for use at retail outlets and mobile points of sale. It supports all payments types - innovative data over voice channel (DOV), NFC, swipe- and smart cards - reliably and securely. No installation or on-the-spot communication are required, cashless payment is up and running in a matter of seconds. 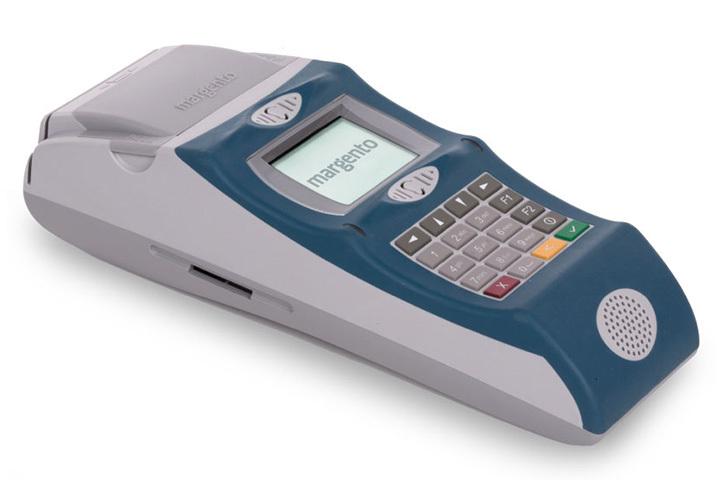 The Margento taPOS terminal is specially designed for use in various ticketing solutions. Combining the ability to work with contactless cards and mobile phones, it is the right choice for public transit, entertainment and tourist attraction ticketing solutions. 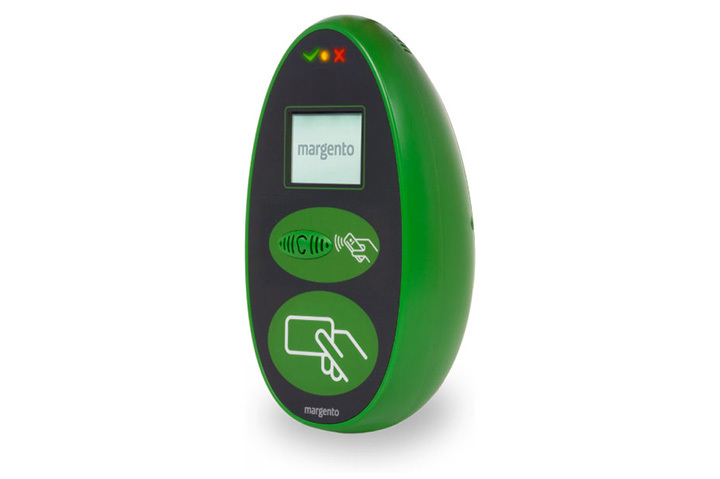 As a part of the Outdoor Payment Kiosk it is also used in Margento parking solutions. 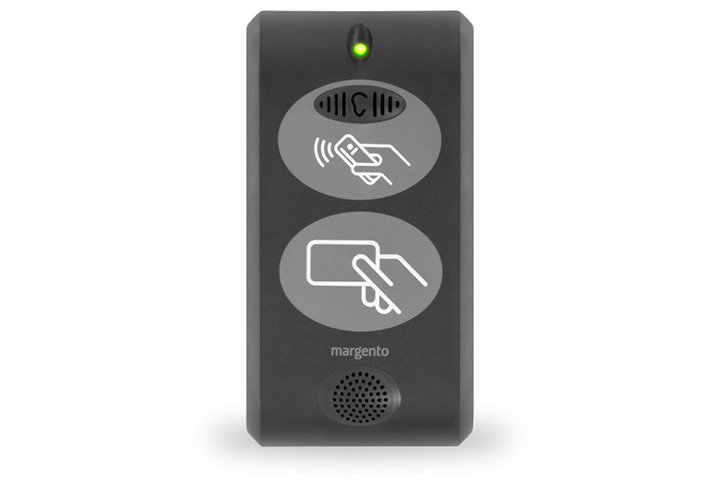 With the ability reliably to transfer data over voice channel (DOV), the Margento taPOS terminal can be used in noisy environments and with any mobile phone. It serves as a contactless card reader / writer, and it also support payments via mobile phones.